The trimming vs. clipping debate has been raging among pet owners for quite some time now. However, one thing is for sure, you can never go wrong with the best dog nail grinder. These gadgets are relatively safe and easy-to-use. With the wide variety of choices available on the market, though, knowing where to invest your cash might be a little challenging. Fortunately, we have some reviews and a buying guide for you. From corded to cordless dog nail grinders to ones that use diamond bit grinders, the following is a comprehensive run-down for you. We request you to use it to take a few quick notes so you can make an informed choice. This is probably one of the best nail grinders under $50. Why so? First off, it boasts a strong housing. This is made from high-density plastic which offers long-term protection to the delicate inner accessories. Besides that, this cordless pet grooming kit uses a two rotation speed setting. This leaves you to carefully and neatly grind your pet’s nails in different modes. Of course, that’s a big plus for anyone with a delicate, little pooch. And the icing on the cake, this unit is compatible with different sanding drums. This makes it one of the best-priced grinders available on the market. Powerful battery with a 3-hour runtime. You have to be really picky to pick a gripe with this one. We’d give it a clean bill of health. Hertzko Pet Electric Grinder has many features for ensuring that your pet’s nails are well groomed. The machine uses a Diamond Bit Grinder to trim nails by filing them instead of blades that are common in traditional clippers. Diamond Bit Grinders are safe, durable, and effective. They trim nails to the right size, without over-trimming. Also, the Hertzko Nail Grinder is designed with three ports for trimming different sizes of pet nails. You, therefore, can use it to trim nails according to their size. The grinder is available in small and medium ports. For larger pets, it is advisable to remove the guard and use the bit grinder as it is. In addition, the grinder operates with low noise and vibration making it dog-friendly. Besides that, the task of maintaining this grinder is pretty straight-forward. You only need to clean the grinder by removing the cover from the stone and cleaning it. Although the grinder is easy to grip and use, it is a bit slow. You, therefore, would need to be patient to complete the trimming task. Moderately quiet with low vibration. Trims nails to the right size. Can be used on a variety of pets. FurryFido Electric Pet Grinder is designed with many user-friendly and pet-friendly features. It has two operating speeds, 7, 500 RPM and 10,000 RPM. The two make it very powerful and also suitable for trimming small and mid-sized pet paws. On top of that, the FurryFido uses sanding bands to trim the nails of the pet. The unit is lightweight, compact and has an ergonomic and artistic design. This makes it easy to trim your pet’s nails with it. You only need to hold the grinder with one hand while using the other to hold your pet’s nails. You, therefore, don’t need an extra person to help you when trimming your pets’ nails. What’s more? The grinder is also quiet and has a light for illuminating the pet’s nails. This is a handy feature for pets with dark nails. One thing we didn’t like about this grinder, though, is that its sanding bands will need to be regularly replaced. It is safe on the pet’s nails. It trims and also smoothens the nails. It does not use rechargeable batteries which are easier to maintain. Batteries have to be bought separately. Not ideal for large breed dogs. A good grooming tool will remove most of the struggles that come with grooming your pet’s nails. The URPOWER Electric Grinder uses a diamond bit grinder instead of blades for trimming nails. The grinder not only trims but also smoothens the nails. Diamond bit grinders are effective as a trimming tool and are generally safe. They grind nails to the right size and you don’t really need to be a guru to use them. The machine is sturdy and made to last. It’s, therefore, ideal for both professional and home use. The grinder has three ports meant to suit different pet nail sizes. Besides that, the grinder is light in weight and ergonomically designed with a soft-touch grip. As such, it’s quite comfortable and you can use it to groom your pet’s nails with no qualms. The only major issue we found with this grinder is that its motor is not as quiet as you’d expect. So, you’d want to try another machine if your pet is overly sensitive to vibrations. It can be used on a variety of pets. It is battery operated and not rechargeable. Oster Premium Electric Grinder has many features worth considering for safe and effective trimming of your pet’s nails. The motor rotates during the nail grooming process trimming the nails by grinding them using stones. Therefore, it is safe and comes with no risk of injury. What’s more? The grinder has an adjustable safety guard for ensuring that your pet’s nails are never over trimmed. In addition, the motor is designed with two-speed settings for a custom pet trimming experienced. Also, the motor is whisper quiet, making it ideal for trimming animals that are noise-sensitive. It’s pretty easy to use this grinder because of its ergonomic and user-friendly design. You only need to start by selecting the safety guard that matches the size of your pet’s nails. Then, hold the grinder with one hand and your pet with the other and begin to grind. One issue we didn’t like about this grinder is that its batteries aren’t long-lasting. So, you may need to keep replacing them every so often. If you never want to worry about replacing batteries or charging them, the ConairPro Electric Grinder might tickle your fancies. The grinder can be used in both residential and home settings. The dog’s nails are trimmed by being filed by a rotating device attached to the grinder. The ConairPro has a guard that prevents the nails from being injured during cutting, providing a safe length to trim. Also, the motor is quiet and can be used without causing anxiety to your dog. The grinder is lightweight and ergonomically designed and therefore user-friendly. One thing we didn’t like about the ConairPro dog nail grinder is that some of its apartments are pretty feeble. Luckily, replacement accessories are readily available to meet this need. Never need to worry about running out of power. Trims and files nails simultaneously. It is expensive compared to other pet grinders. It is corded, and that means the cord has to be managed during operation. If you want a grinder that has no battery maintenance issues, this one from Oster might be an awesome find. It’s fitted with a long cord which is easy to maneuver. The Oster is designed with different speeds settings and, therefore, perfect for trimming different types of nails. You get to choose the speed that is suitable for your pet. The machine is user-friendly. For instance, it is light in weight and has an auto-stop feature to prevent mishaps during operation. On the flipside, though, using the Oster at a high-speed setting causes it to produce a loud vibration. Needless, this may irk your doggie especially if you’re dealing with a hyperactive one. It can trim many types of pets. No interruption of trimming because of batteries running out of power. It is more expensive than other grinders. Many attachments that need understanding. Trimming your pet’s nails should be easy on you and your dog. NG-012 URPOWER Electric Pet Nail Grinder uses a diamond bit grinder to trim and smoothen your pet’s nails. Diamond bit grinders are safe, effective, and long-lasting. A rechargeable battery powers the machine. It is also USB rechargeable. On top of that, the battery takes a paltry 2 hours to recharge, in turn giving you 3 hours of run-time. In addition, it has an LED light, useful for illuminating especially dark nailed dogs. Besides that, the grinder is fitted with three ports for trimming dogs with different nail sizes. Choose one to match your dog’s nail characteristics. Unfortunately, NG-012 URPOWER Electric Pet Grinder is specifically designed for small and medium-sized pets leaving out large dogs. The grinder does not get worn out quickly and therefore needs no replacement. Long battery running time of 3 hours. The rotating head makes a sound that can scare away anxious pets. 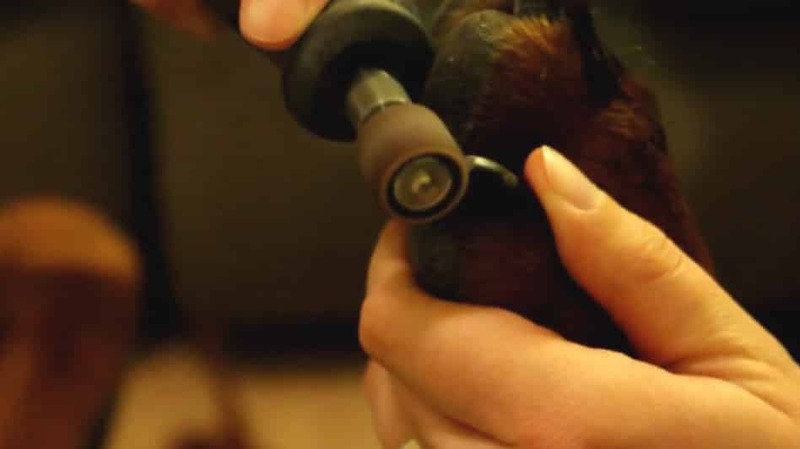 Trimming a dog’s nails is a regular job that requires a safe and effective tool. Furminator Professional Electric Grinder has a powerful motor that delivers professional results. The motor is designed with two speeds to suit different nail characteristics and needs. The grinder has a LED light for illuminating the grinding operation. Indeed, the Furminator makes grooming your dark-nailed pets easy. The grinder also operates with moderate noise, and it is not too loud. In addition, it is lightweight, cordless and has an easy grip and, therefore, is comfortable to use. What we don’t like about this grinder is that you have to replace the grinding bands from time to time. This can prove a little frustrating especially if you’re not a DIY enthusiast. It trims and also smoothens a pet’s nails. It is safe on the dog. It is quite affordable because it is discounted. It has a light for illumination. Saves you money you would have used at a professional groomer. Uses replaceable batteries and not rechargeable. The Wahl Professional Electric Grinders Model #5973 is a product of Wahl Clipper Corporation, which was founded in 1919. The machine has a powerful motor which operates at different speed settings. In fact, you can scale it up to 13,000 RPM when necessary. This increased versatility allows you to manage different nail characteristics with no qualms. As such, you can use the grinder on various pets including cats, dogs, birds, hamsters, rabbits, and guinea pigs. The Wahl grinder comes with finger grips and is generally light in weight. We, therefore, think this 11-piece kit represents good value for money. We only wish the manufacturer had considered a more reliable option than sandpapers instead of traditional grinders. As you can tell, sandpapers need frequent replacing for the machine to operate optimally. Ergonomic design and finger grips. Suitable for trimming small, medium and large sized pets. It is made specifically for the USA market and not for international use. It is corded which requires managing the cord during trimming. Never compromise on your dog’s safety when buying a grooming tool. The AMIR Electric Cordless Pet Grinders uses diamond bit grinders which are long-lasting and effective than sandpaper. The grinder trims the pet’s nails by filing them instead of cutting them down. This makes it a safer option than traditional nail clippers. The grinder has three ports. Port #1 trims small sized nails, and port #2 trims medium-sized nails while port #3 trims large nails. The AMIR is also designed with a mute technology, making it easy to trim your pets without them being tense. In addition, the grinder has a cover to trap nail grindings for safe disposal. Also, the grinder is ergonomically built for comfort during grooming. We, however, don’t like the idea of using AA batteries because they will need to be replaced every so often. It uses a diamond bit grinder, therefore no need of replacing the grinder. It is suitable for trimming small, medium and large pets. It trims and also smoothens nails. The motor runs with low noise. Easy to clean up because of the cover. Dog nail grinders come in different makes and sizes. As a first-time buyer, you might easily get lost in the sea options. But this doesn’t have to be the case if you’re a keen shopper. Here are the three key factors to take into account. Corded units eliminate the hassle of changing batteries and recharging them. On the downside, though, they limit your area of operation to the length of the cord from the plug. Cordless grinders, on the other hand, give you unlimited freedom though you’d need to keep replacing and recharging the batteries. So, choose one that best suits your needs. Looking for added flexibility? We’d recommend going for a multispeed grinder. However, you can always stick to the basics and save a few bucks if you’re a frugal shopper. Pets can get playful when you least expect. Therefore, it’s a good idea to invest in a unit that comes with a strong housing just in case it falls accidentally. Each one of the 11 grinders that made it to this list deserves to rank right at the top. However, there can only be one winner. In that case, we’d confidently hand that title to the Dremel Pet Nail 7300-PT Grooming Tool. It presents you with a decent combination of features and you can bank on it as a reliable tool, any day. We particularly like it because it is well-priced, powerful, and easy to use. If your dog goes ballistic when you whip out some clippers or scissors, it is high you shift to using grinders. And as we have seen in this list of the best dog nail grinder reviews, there’s a lot in store for your pup to savor.